Merely vesting in a pension plan is not sufficient to guarantee a decent benefit, and many vested teachers would be better off withdrawing their contributions than waiting to collect a pension. That reality has taken me a while to grasp, because it's counter-intuitive, and because vesting in other types of plans matters much more. So let me start by explaining how vesting works in defined contribution, 401k-style plans. In a defined contribution plan, the employer makes a contribution as a percentage of the employee’s salary. Employees qualify for those employer contributions after they reach a certain number of years of service, called the vesting period. Employees who leave before vesting forfeit their employer's contributions. Say an employee starts out with a salary of $40,000, and the employer contributes 5 percent into the employee’s 401k. In the worker's first year of employment, the employer contributes $2,000 (5 percent of $40,000) to the employee's 401k, but that money is not vested yet. The employee is entitled to that money only if he or she reaches five years of service; short of that, and the employer keeps it. This is part of the reason why, in a new report out this week, we found that immediate vesting would significantly improve the percentage of workers who qualified for adequate retirement benefits in defined contribution and cash balance plans. In contrast, immediate vesting would do virtually nothing for the vast majority of teachers in defined benefit plans. That's because vesting works differently in these types of plans. An example may help here. Consider the case of a 25-year-old teacher who started her career last fall in Los Angeles. She’s automatically enrolled in the California State Teachers Retirement System (CalSTRS). CalSTRS has a five-year vesting period, which means she’ll first qualify for retirement benefits if she leaves after her fifth year of service, at age 30. But she won’t be eligible to begin collecting her pension benefit until she reaches age 62, in the year 2055, and it will be based on her salary in her final years of service, in the year 2023. By the time she's able to begin collecting, inflation will have significantly worn away her benefit. Critically, this distinction affects young teachers much more than older ones. That’s because older teachers are already close to retirement, and they won’t have to wait as much time for inflation to wear away their benefits. The graph below, from an Urban Institute report by Richard Johnson and Benjamin Southgate, helps show what this looks like. Each line represents the value of a teacher’s pension benefit, net of her own contributions, depending on when she started teaching and how long she serves. I’ve added an arrow pointing to the five-year mark when teachers in California qualify for a vested pension from CalSTRS. Note that, while all teachers technically qualify for a pension after five years of service, that benefit is negative for all teachers hired at age 25 or 35. 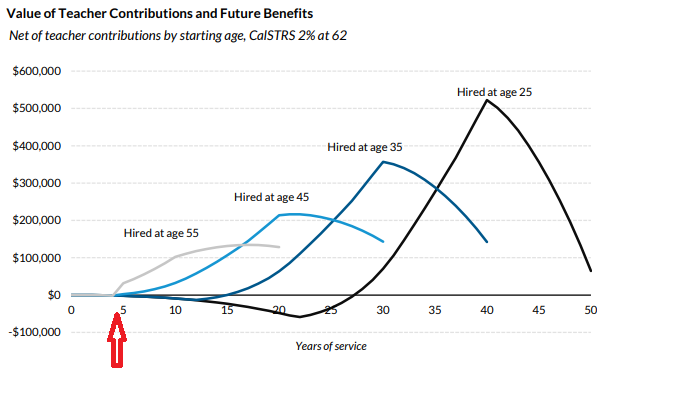 It’s only for teachers hired at age 45 or 55 where vesting produces a positive net benefit. To put this in perspective, consider that most teachers begin their careers in their 20s or 30s. According to data from the National Center for Education Statistics, only about 7 percent of California teachers began their teaching career at age 45 or later. Another way to say this is that vesting produces a positive benefit for only 7 percent of California's incoming teachers. Of course if they continue teaching their benefit will continue to grow, but as the graph above makes clear, California teachers may have to stay for 15, 20, or 25 years before realizing a positive net pension. Teachers who leave the system also have the option of withdrawing their own contributions, but even vested teachers in most states do not qualify for employer contributions. That's true in California as well. For many departing teachers, cashing out and withdrawing their own contributions is often a better deal than leaving their contributions with the plan and waiting to collect a pension. In doing so the employee forfeits the guarantee of the pension, but that’s often the right financial decision. States know this too. In a piece last year for The 74, I noted that North Carolina dropped its vesting period from 10 years to five after finding the change cost very little. Other states could likely do a similar analysis and find that their vesting periods are largely symbolic. Moreover, when we looked at the data on teacher behavior right around vesting periods, we found that teachers do not stick around longer just to vest in their state's pension plan. Given the data I've explained above, teachers are making a rational decision to ignore vesting periods when they're deciding whether to remain in teaching or not, but that means vesting periods are really only accomplishing two things. First, vesting periods do limit the retirement benefits earned by teachers who enter the profession in their 40s and 50s. Second, for younger teachers, vesting periods are forcing risk-averse teachers to choose between withdrawing their contributions or waiting for a "guaranteed" pension, even if that pensions might be worth less than the teacher's own contributions. In both cases, vesting periods help the finances of state pension plans, but they're bad for teachers.